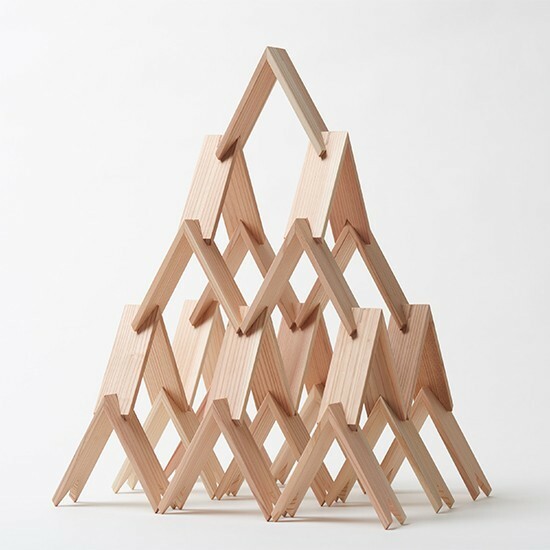 Scaling down from the 2020 Tokyo Olympic Stadium, Japanese architect Kengo Kuma has teamed up with forest conservation organization More Trees to create a set of triangular-shaped wooden building blocks. The stackable kit of parts is made of Japanese cedar wood, and has been described as the Japanese version of Lego. The minimalist design of each block, known as tsumiki, or “wooden blocks” in Japanese, allows for countless different configurations and arrangements. The pieces can be easily disassembled and restacked. People of all ages were able to enjoy Kuma’s creations at Tokyo Design Week last November, where Kengo Kuma & Associates formed a pavilion made up of giant-sized tsumiki pieces in a central Tokyo park. “I have loved tsumiki my whole life, every since I was a young boy. And my dream came true, I designed tsumiki myself, the sort which hadn’t existed before,” said Kuma in a statement. “The set is not a heavy, masonry kind of wood block, but a light, transparent system just like what you see in traditional Japanese architecture.” The individual wooden pieces are reminiscent of the pavilion that Kuma designed in Paris’ Jardin des Tuileries, which is made of a complex lattice of identical stacked timber beams. Kuma is known for his explorations of timber construction, and has employed woodworking in a number of projects including the Daiwa Ubiquitous Computing Research Building and the Sunny Hills retail store. Kuma’s building block set is available in three different sizes: a 7-piece set, a 13-piece set, and a 22-piece set. 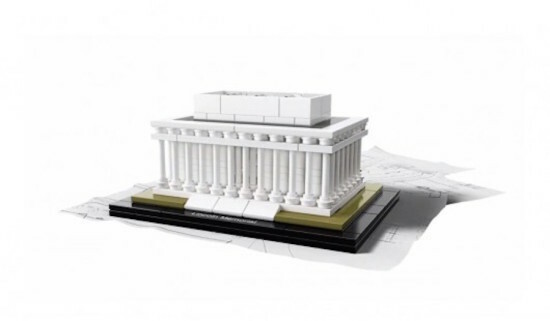 A miniature LEGO model of the Lincoln Memorial has just launched under the LEGO Architecture brand, a “Lego for grownups” product line that celebrates architecture and the chameleon capabilities of the LEGO brick. Featuring recreations of landmark buildings such as the Leaning Tower of Pisa, Sydney Opera House and Dubai’s Burj Khalifa, the latest set honors the memorial completed in May 30, 1922 in homage to the 16th president of the United States. The final cost of the memorial approached $3 million, although just $2 million had been initially allocated. Despite not being immediately apparent to the naked eye, the building’s columns and exterior walls are slightly inclined toward the interior to compensate for visual perspective distortions that would make the building appear to bulge at the top. Honoring the 57th anniversary of Lincoln’s assassination, the memorial designed by Henry Bacon resembles a Greek temple, with 36 fluted Doric columns to represent the number of recognized states at the time of Lincoln's death. Visible from the outside is the famous oversize statue by Daniel Chester French, with Lincoln’s left hand clenched to symbolize strength and determination and his right palm open in a show of charity and compassion. While the LEGO model measures a mere two inches tall, 4 inches wide, and 3 inches deep, it has an easily removable roof for viewing the statue inside. Aspiring towards a true-to-life remake, the model includes the steps leading up to the building from the reflecting pool. The set includes a sorely-needed plastic brick separator for detaching those notoriously clingy flat bricks, as well as a 65-page instruction manual. Skyscrapers are usually admired for their mighty feats of structural engineering. Respect though you might the elegance with which Chicago’s Willis Tower lifts steel and glass 1,451 feet into the sky, you probably wouldn’t want to nuzzle it. A Chicago startup wants to make plush toys with the forms of famous skyscrapers, and Willis is one of their first prototypes. 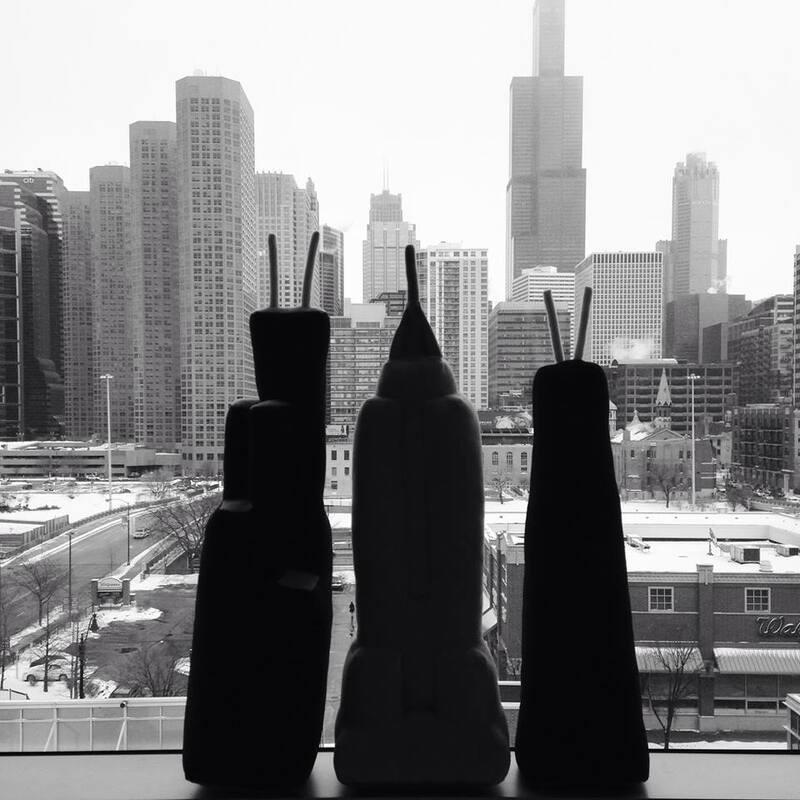 Squeezable Skyline launched their Kickstarter campaign this week, asking for $25,000. The toys would retail for $29.99. The 22-inch Willis replica would be accompanied by a 21-inch Empire State Building. 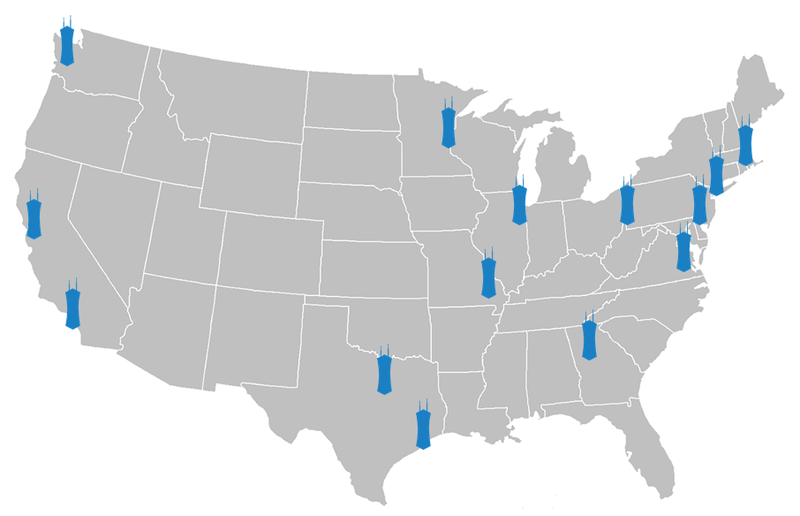 If funded, the team’s line of “huggable high-rises” could include 25 skyscrapers from across the U.S. “Our 'Squeezables' are simplified massings of the real buildings and are designed at a relative scale to look great together as you build your collection,” writes the team—Michael Gordon, and brothers Brent, Glenn and Struan Robertson. In a hybrid of LEGO and origami, Paper Punk has created their first boxed set of punch-and-fold, customizable paper building blocks. Urban Fold is the California-based company’s newest creation by founder Grace Hawthorne, a designer, author, and artist from San Francisco who currently teaches at Stanford University’s d.school (Institute of Design). The set gives builders the opportunity to create a paper city in punchy colors and patterns, inspired by Berlin graffiti and the photography of Matthias Heiderich. 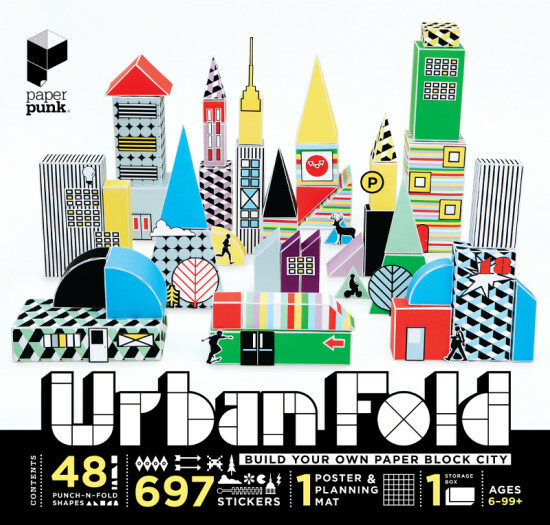 Urban Fold contains 48 buildable shapes and 697 stickers, an urban planning map, and an idea guide to creating the shapes of the world’s most popular cities. Each paper building block comes in a bright shade and/or a geometric pattern and the stickers can transform triangles into spires, quarter circles into windows, or squares into moveable pedestrians. For Hawthorne, the boldness of the set was key, “I wanted to create an urban-minded build/play experience that was also eye-candy, just impossible to resist because it’s bursting with colors, patterns, cool graphics,” she said in an interview for Mediabistro. These multi-colored blocks can be arranged and stacked with complete creative freedom and, like traditional wood building blocks, can be built up and knocked down for infinite construction and reconstruction. If a builder prefers a minimalist look, the shapes can also be folded inside out to be all white. “I refer it to an open box set because there are so many pieces to it," Hawthorne commented, “What anyone can create with it is only bounded by their imagination.” After 16 months of testing, Paper Punk's imagination brought forth the innovative project, but only with funding can it come to reality. In the same way that her company was launched last year, Hawthorne has taken to a Kickstarter campaign. With a $33 backing pledge, builders of all ages can own a Urban Fold architecture toy set. 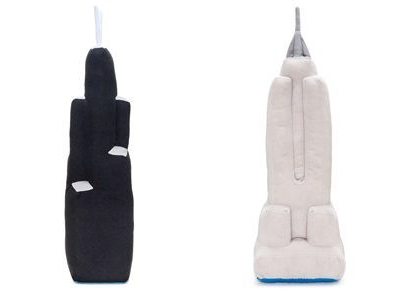 The funding period ends on December 2nd and the company promises a shipping date in time for the holidays. Twenty of the world’s biggest architects were asked to design on quite a small scale last month. Cathedral Group commissioned architect-designed dollhouses for a charity auction to benefit KIDS, a United Kingdom-based organization supporting disabled children. A Dolls' House sold the interesting toys a few days ago at Bonhams in London and Zaha Hadid’s 30-inch-by-30-inch, puzzle-like home, This Must Be the Place, received the night’s highest bid: $22,500. Hadid’s design is based on a previous commission from the German Design Council, her 2007 Ideal House Colonge Pavilion. Each of the charity dollhouses was required to explore an innovation that could improve the life of a disabled child. 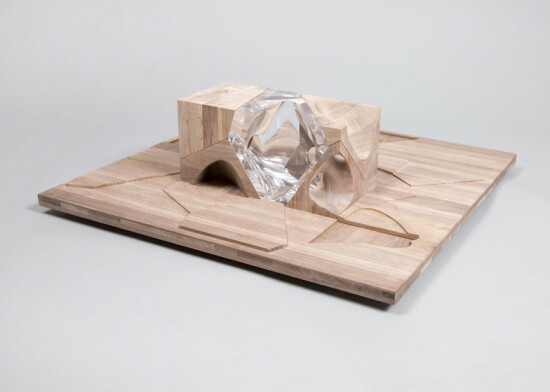 Drawing from her Cologne Pavilion’s inquiry into the concept of an “ideal house,” Hadid’s toy dwelling is a puzzle of six interlocking wood or Perspex forms, representing rooms of the home. The pieces can be disassembled and rearranged in multitudinous possibilities, rotated to fit in grooves on a surrounding wood platform. In this way, the dolls’ home can be expanded or closed in an instant; a single action can bring the rooms together or create free space for movement. A dollhouse design by Lifschutz Davidson Sandilands was the second highest bid of the night, collecting nearly $18,000. Overall, the charity auction raised over $145,000 for KIDS. In 50 to 75 years, SimCity, the virtual city-building game just about every architect or planner has played around with at some point, imagines an average metropolis taking two routes—a sustainability-based, green utopia or a money-driven, oil-dependent corruption—and gives players the tools to construct these futures. 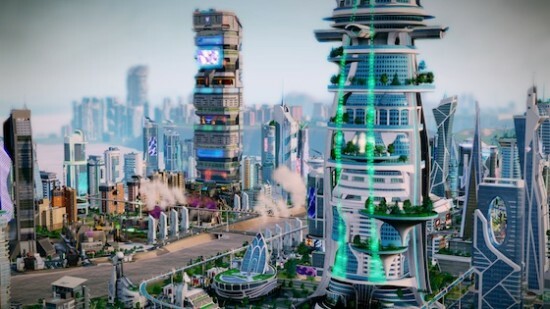 Slated for release in the United States on November 13th, Cities of Tomorrow, the new SimCity expansion pack, allows players to engage in futuristic urban planning using imagined versions of current technology. Elevated Maglev trains transport passengers high above congested vehicle traffic; drones deliver packages and prevent neighborhood crime; high-rise “MegaTowers” become mixed-use complexes with customizable retail, residential, education, and solar energy plant levels. However, PSFK reports that unlike previous editions of the game, the Cities of Tomorrow expansion requires its virtual city planners to consider the tradeoffs of their architecture and urban construction efforts. Source and type of energy for power will determine the government and pollution level of each town and consumerism and lure of cheap labor can overcome clean, sustainable methods for maintenance of each urban environment. Children are the focus of twenty new designs by some of the United Kingdom’s top architects. 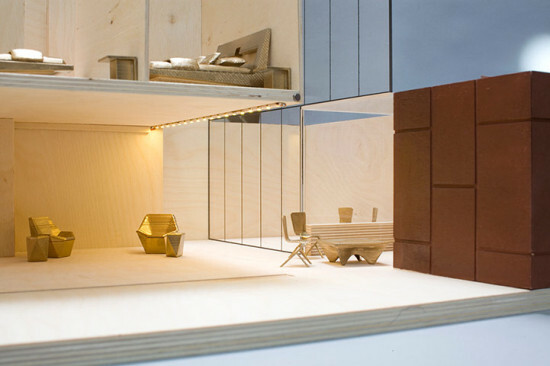 A Dolls’ House, launched by UK property redevelopment firm Cathedral Group, invited architects like Zaha Hadid, David Adjaye, and Alford Hall Monaghan Morris to scale down their architectural feats to a miniature size, each creating a dollhouse of innovative design for auction at Bonhams next month. According to the design brief, each architect’s dollhouse must include a component that would ease the lives of children with disabilities and be able to sit on a 2.5-foot-by-2.5-foot plinth. These unique toy homes recreate the traditional plaything, exhibiting 21st century British art, construction, and creativity. Catherdral Group has pledged nearly $160,000 (£100,000) in A Dolls’ House proceeds to benefit KIDS, a UK charity for disabled children. Currently, the architect-designed dollhouses are available for online bidding but the final auction will take place in person on November 11th. As of yet, most of the reserves have not been met. All Images Courtesy A Dolls' House. On August 1st, LEGO released a new kit in its series of building block design sets marketed specifically to architecture enthusiasts. 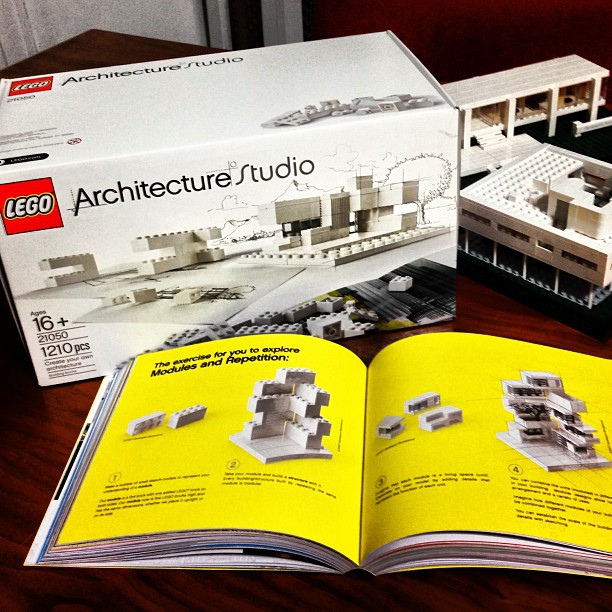 LEGO’s Architecture Studio Kit, from its Architecture Series of adult-catered building sets, consists of 1,200 all white and translucent plastic bricks but no instructions. The free-for-all kit is endorsed by MAD Architects of Beijing and comes with a guidebook of architecture building exercises. Michael Bleby of Business Review Weekly writes that this set "is the first in the range to focus on creativity and architectural principles, rather than a specific architectural icon." A modernist’s dream that costs significantly less than others within the series, LEGO may possibly have caught onto a new niche market. Especially when reviews thus far of the landmark-specific Architecture Series have been mixed from architects and enthusiasts alike. The Architecture Series offers sets of building blocks that instruct users to create small versions of famous architectural landmarks, houses, and buildings ranging from Frank Lloyd Wright's Fallingwater to the White House. Sets are built for the novelty of owning a miniature model, not for the purpose of play and constant redesign, like the traditional primary-colored LEGO bricks marketed at children. However, Business Review Weekly reports that architects purchasing the sets for personal use are increasingly dissatisfied with the scale, lack of detail, and high price of the Architecture sets. In an Architizer critique of the LEGO series, AJ Artemel questions whether these Series sets with their limited pieces, instructions, and purpose actually hinder creativity rather than encourage it: “It seems as if the sort of learning discovered through play and exploration can only take place in an environment with many options and lots of flexibility. And without the large degree of interchangeability offered by LEGO’s sandbox-style sets, the ‘systematic’ overwhelms the ‘creativity.’” In comparison, designs created by owners of the newly released Architecture Studio Kit have no presupposed end. Available online for only $150, builders have creative freedom with the colorless set. Within the constant critique of the architecture world, LEGO's new set promises space for architectural experiment, done in miniature plastic bricks. Century of the Child Museum of Modern Art New York 11 West 53rd Street Through November 5 Is design for grown ups? Hardly. While a child’s own designs might be limited to block towers or crayon masterpieces, design touches nearly every part of early life. Children use toys, wear clothing, play in playgrounds, use furniture, and sit in classrooms, all of which are created specifically for them. Opening at the Museum of Modern Art, Century of the Child: Growing by Design, 1900–2000 surveys the material world constructed for the child over the 20th Century. Visions of children and how design has followed or shaped their perceptions over the past century are considered in the exhibition. 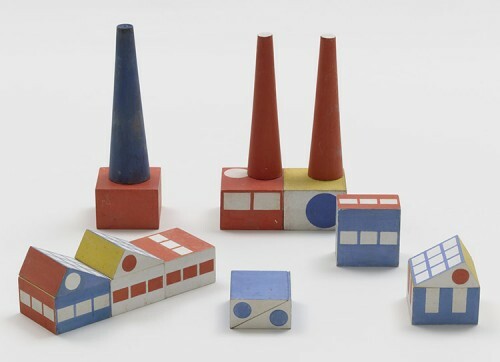 Take Frederich Froebel, whose famous toys (a gift box edition, pictured below) were favorites of Frank Lloyd Wright as a child. Froebel designed his blocks to be given in a sequence, educating children as they learned and matured over time. The exhibition identifies and merges the many facets of design that consider children, presenting these products together and revealing the ideas and ambitions of the designers who created them. "That one's actually interactive," Tucker says. "It actually comes apart in a puzzlelike formation so you can get into the guts of the building and see the levels, understand his use of cantilever and how the forms play together." The Lego version of the building can even be lifted off its base. "What's neat about that is people can actually see how the foundation of a structure is rooted into the environment," Tucker says. Really, though, you have to go listen to the audio, as the fine folks at public radio also put together a mock ad for the new LEGO line. Because really, there's noting like hearing a radio announcer declare, "Kids are going crazy over Usonian homes and organic architecture!"